Imagine this scenario: your club has conducted a community assessment and identified which needs should be targeted through a service project, you have put together a project plan, and now you’re ready to roll up your sleeves and get started. Where and how do you begin to fundraise? How do you find a global grants partner? How do you best recruit volunteers? Where do you find knowledgeable subject matter experts that can lend a hand and guide you along the way? Start locally. Webinar panelist PDG Ron Denham urges clubs and districts to first look for resources within the local community. Whether searching for funding, skilled volunteers, in-kind donations, or partnerships, there is a chance that the local community has the resources that are needed to help implement the project. And when the local community invests resources in a project, it is also more likely to remain involved for many years after the project has been implemented to ensure long-term success. Explore Rotary Grant options. Rotary Grants may be available to help fund Rotary clubs’ and districts’ service projects. Crowdsource for support. Rotary’s crowdsourcing platform, Rotary Ideas, makes it easy for Rotary clubs to request small contributions from a wide network. Clubs post their project in need of assistance and then share the listing with their digital networks through social media, blogs, emails, and websites. Contributors can support projects directly through the tool and need not be part of the Rotary family. Organize a Rotary Community Corps, a group of local people in the community who are not members of Rotary but work closely with their sponsoring Rotary club to assist with projects. These groups help mobilize a community, ensure local culture and customs are captured in activities, and help ensure that local needs are met. Consult a Rotarian Action Groups. These groups consist of members of the Rotary family and provide technical expertise on service projects within a particular area of focus. Currently 18 Rotarian Action Groups exist to help clubs and districts conduct needs assessments, incorporate monitoring and evaluation components, and even secure funding. Build partnerships. “Partnerships provide expertise, local knowledge, insights into the local culture and values, and they provide a means of accessing local resources to provide training and know-how” PDG Denham says. 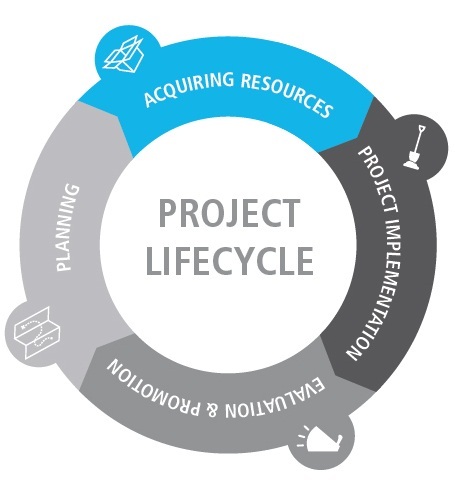 Take the time to build meaningful partnerships, particularly at the local level, for assistance with resources, sustainability, technical expertise, and project longevity. Consult a district leader. Every year, district governors appoint district leaders to lead service committees and assist club and district level humanitarian initiatives. Network at Rotary events. Many partnerships begin with a face-to-face meeting at a Rotary event: the annual Rotary International Convention, International Assembly, regional project fair, zone or district event, or while traveling and meeting with Rotary clubs. Don’t let these opportunities pass you by! Engage young professionals. Rotarian Thuso G. also reminds us that “involving [youth and young professionals] brings energy and chances of continuity.” Young professionals also have innovative ideas to securing project needs and implementing projects. Remain transparent. Open, consistent communication is key to building relationships and acquiring needed resources. Rotarian Jannine B. urges project coordinators to “keep everyone involved in the loop so avoid duplication of effort and things don’t slip through the crack”.